Do you sit upon your throne, ruling the world around you with your mind rather than your heart? If so, you might have a lot in common with the Egyptian Zodiac Sign Sekhmet. Characteristics of the Egyptian Zodiac Sign Sekhmet: If your sign is Sekhmet, you live in a world of two extremes – pure versus impure, righteous versus base, order versus chaos… You're very strict and authoritarian, especially with yourself, where you rarely give in to your desires. You have very high expectations for yourself, and set the same standards for others. You observe everything around you with a feline grace and appreciation for beauty. You are extremely intelligent, optimistic and intuitive. You have quite the temper, especially when you become impatient, which happens all too often. 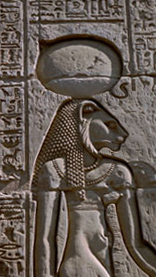 About the goddess Sekhmet: Sekhmet is one of the oldest of the Egyptian Gods and Goddesses. She was the original goddess of war, as well as the goddess of healing for Upper Egypt. She was the protector of the pharaoh, and used her breath to create the desert. She was one of the sun gods, and often appears as a lionness or as a woman with a lionness' head and the sun above her. Sekhmet was not a compassionate goddess. She issued justice with a mathematical precision. You were either guilty or you weren't. There was no leniency of the law. Your punishment was equal to the crime, regardless of the circumstances. Her priestesses performed rituals to placate Sekhmet every day of the year. If angered, she could send plagues or make the rivers run red in blood. Yet, she was also a great healer to those she liked – curing diseases, illnesses and the plague.